How do you know if a business partner is stealing? 01 May How do you know if a business partner is stealing? The business world can be extremely cut-throat and competitive. You should be careful who you do business with. There are countless cases of business partners acting immorally or even illegally towards their business for personal gain. Wouldn’t you want to know if a business partner is stealing from you? What can you do? A common fraud that is seen within business deals specifically with procurement. With minimal oversight, a business partner can easily profit. With reason to believe that a business partner is stealing by committing procurement fraud, calling in a PI is the first step to getting some answers. They can investigate to determine whether one’s business partner may have committed fraud. 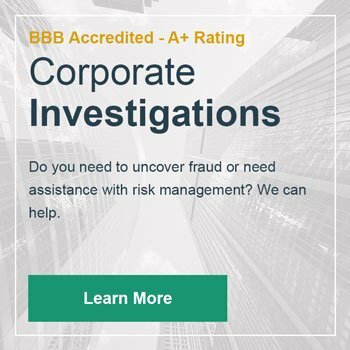 Investigating fraud inside of an organization varies in difficulty. Many times business partner theft can easily be detected through forensic accounting. There are cases where individuals are very creative and aware of what they need to do to conceal their fraud. Working with an investigator will give you access to tools not typically available to normal citizens. Besides tools, investigators have the experience and network of professionals to perform a thorough analysis. It is not unheard of for employees or even a business partner taking money from a company by committing workers’ compensation fraud. Dishonest and manipulative people will use worker compensation to their advantage. They may even go as far as to produce doctored paperwork stating they are unable to perform their job duties for a certain amount of time, making it look like they are entitled to workers’ compensation as a result. Often, hiring a PI to investigate the case exposes an individual as a liar and a fraud. When this happens, the guilty party has no choice but to retract their worker’s compensation claim. A PI should also be called in when a business partner is putting the company’s assets at risk. They have ways to determine if a partner is stealing cash from a business. Since stolen cash is the most common type of asset fraud, most PIs have experience dealing with it. In some cases, asset fraud can involve either intellectual data, company property, money, or all the above. Though some cases of asset theft are isolated others are much more widespread. The best PIs can handle either type of situation. A business’s cash flow is something that must be closely monitored always. An interruption of this cash flow is often the result of a dishonest business partner thinking they can trick their other partners into a false sense of security. Asset discovery is a sure way to determine if an individual is taking money from a company. With basic information, you will be able to determine if your business partner is stealing. Owning and operating a business is a difficult proposition. With so many areas under your watch, it can be difficult to know or detect if a business partner is stealing. It is crucial to know the signs so you can act fast. When anyone suspects, a business partner is stealing money from their business, hiring a PI is an effective way to have them caught. Trying to investigate themselves can find minimal results while a PI has unprecedented access to everything they need to help prove guilt in a fraud case. Business owners and management that hire a PI are grateful they have someone on their side. Without them, an individual could get away with their illicit activity. This happens far too often in the business world, which is why it is so important to always watch your back. Even when you think you have an honest business partner it pays to be vigilant. There are so many ways that a business partner can steal money. There are so many examples of the different ways in which theft occurs in the business world. Procurement and workers’ compensation fraud have plagued businesses for years. No matter what type of business you own it is important to understand each of these type of fraud so that you can be on the lookout for them. While most people do not fully understand workers’ compensation as well as procurement fraud. Often people tend to think that it couldn’t happen to them. An effective PI can explain to you the differences between the types of fraud. When you understand, what constitutes each type you will be better prepared to ensure that a business partner is not guilty of any of them. Learn how a private investigator can help you discover if a business partner is stealing.